After arriving in the United States a few years before the outbreak of World War Two, Pierre Monteux made a fair number of recordings for RCA Victor, first with the San Francisco Symphony Orchestra, and later with the Boston Symphony Orchestra. Still, he was not the label's favored conductor during the 40s and 50s; that honor went to Arturo Toscanini. As a result, Monteux did not have the opportunity to record as much of his repertoire as he might have. Fortunately, like Toscanini, he participated in many radio broadcast performances, and these have been preserved. Starting in the 1940s, Standard Oil of California sponsored a Sunday evening radio program called "This Hour is Yours," and it featured commercial-free live performances of orchestral music played by orchestras in San Francisco and Los Angeles. Monteux participated in these programs until 1952, when he left his post in San Francisco. The music that he conducted tended to be more popular than one would often hear during a subscription concert, but by no means was it all of the lollipop variety. The only limitation imposed by Standard Oil was that no selection could be longer than 23 minutes. This, of course, ruled out the longer symphonies and concertos, for example, although individual movements sometimes were programmed. This impressive 13-CD set includes a very generous selection from Monteux's Sunday evening broadcasts. Music and Arts posts prominent thanks on the front of the box to Nancie Monteux-Barendse and The Pierre Monteux School for Conductors and Orchestra Musicians. (This is the school that Monteux himself founded in Maine in 1943.) The excellent performance-by-performance annotations are by music critic Arthur Bloomfield, who was fortunate to see Monteux conduct the San Francisco Symphony Orchestra on many occasions, and who even sang in the chorus during one of the "Maître's" performances of Beethoven's Ninth Symphony. These 13 discs are being sold for the price of eight. This newly-remastered set – as always, Maggi Payne has done fine work – replaces an earlier version from a few years back (CD-978) – one which was three discs shorter. 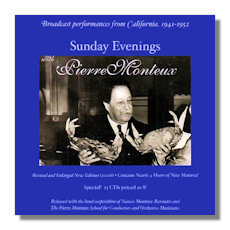 Sunday Evenings With Pierre Monteux is an excellent companion to another Music and Arts release, Pierre Monteux in France (CD-1182, 8 discs), which includes performances from 1952 to 1958. Monteux recorded all of the Beethoven symphonies at least once, although those recordings seem to have fallen a little out of favor in recent times, given all the hullabaloo about original performance practice, revised editions and the like. Monteux's stereo Fifth with the London Symphony is something akin to genial, without shortchanging the music's fist-shaking drama. The performance here – or composite performance, I should say – is more volatile, although it too lacks the monumental fatalism of many a more acclaimed reading. With the exception of Consecration (which is more appropriately measured in tone), the overtures are done with gusto, and even a disarming lightness, which is something one doesn't always get in Beethoven. The Adagio from Creatures is performed with classical delicacy. The "Haffner" Symphony also was a work that Monteux recorded in the studios, but late in his career, and overall, Mozart did not occupy the conductor as much as Beethoven. (Monteux was most likely to head in this direction when he had guest soloist who was so inclined – Lili Kraus or Yehudi Menuhin, for example.) Monteux's San Francisco "Haffner" is warm and human, with more sly touches than moments of fragile beauty. The overture to Don Giovanni is terrifying (rightly so), while The Magic Flute has more fun than gravitas. Monteux throws himself into the Turkish music in The Abduction from the Seraglio with obvious enjoyment. Kapell's jeweled tone suits the two movements from the concerto well. The Gluck overture, like the Beethovens on Disc 1, is played with an energy than does not preclude dignity. As for Haydn's 88th – delightful! Monteux had a special affinity for Richard Strauss's music, but he did not get to make very many recordings of it, so this disc is decidedly valuable. It gets off to a superb start with a passionate, virtuosic Don Juan. In fact, some of the love music is downright pornographic in its intensity, and elsewhere, the title character's failed heroism comes forward loud and clear. Death and Transfiguration also is given a passionate reading, but it is a little too hectic for me, although the orchestra's strings sound gorgeous in the "transfiguration" portion. Monteux plays it in just 22:34; I find that any reading faster than 24 minutes is unconvincing. Till Eulenspiegel's Streiche are particularly lustige here. This score brings Monteux's impish sense of humor to the fore. (Also, butter wouldn't melt in concertmaster Naoum Blinder's mouth during his solos.) In the Rosenkavalier Suite, gentle satire never is far beneath the sentiment. Monteux gets the irony right, and again, the orchestra plays beautifully for him. French conductors typically are not associated with Wagner's music, but there are exceptions: Cluytens, for one, and of course Monteux. Parsifal, Wagner's sacred music-drama, is treated affectionately by Monteux, albeit with respect, and the San Francisco brass make a fine showing here. The Act One Prelude to Die Meistersinger is refreshingly low on pomp and long on tonal splendor and singing quality. The Act Three Prelude is taut and moody, with a great sense of forward impetus. The apprentices dance with an endearing skip in their step, and the masters process most impressively – but again, with circumstance, not undue pomp. Monteux greatly emphasizes the contrast between the storm music and the music associated with Senta in the Act One Prelude to The Flying Dutchman. This is a splashy performance which will leave you feeling seasick, if you are prone to that malady. The Tristan Liebestod builds to a genuinely orgasmic climax, and the Prelude also glows with unusual warmth. Monteux's affinity for Wagner is reaffirmed time and time again on this disc. More Wagner, and again, Monteux never runs the risk of letting the music suffocate under its own weight. Wagner seldom gets more lyrical or caressing than this. I must admit that I prefer a more bombastic (!) approach to Rienzi. Nevertheless, Monteux's reading won't fill you up: it is more a flaky French pastry than a Black Forest Cake! Speaking of bombast, there is none in this version of Liszt's Les Préludes (imagine that), and you won't even think of Flash Gordon serials as you hear it. I am half-Hungarian (I won't say which half! ), and I can tell you that Monteux's Hungarian Rhapsody is the real thing. Monteux was famous for his Berlioz, and so it is appropriate that an entire disc is devoted to this composer, even though Monteux made many studio recordings of his music. Everything here is treasurable. The conductor coaxes some of the most fantastic and delicate playing out of his orchestra in the excerpts from The Damnation of Faust, and in the Roman Carnival Overture. (For once, the "Marche hongroise" sounds authentically Hungarian. Judging from this and the Liszt Hungarian Rhapsody on the previous disc, Monteux must have had a drop or two of Magyar blood flowing through his veins.) It is interesting to compare Monteux and Toscanini in the excerpts from Roméo. Both conductors are driven in the opening section and in the "Fête at the Capulets," but Monteux finds a Tristan -like longing and eroticism in "Roméo Alone" and the "Love Scene." I also enjoyed the music from L'enfance du Christ, because Monteux doesn't make it too sweet, as it sometimes can be. The two Mendelssohn overtures are feisty affairs in Monteux's hands, although he hasn't recaptured the ability of Fingal's Cave to make us feel cold and windblown. The "Italian" Symphony features a hectic first movement and a reined-in saltarello Finale, with many tender moments in the two middle movements. All in all, it's a likeable reading, but not among the very best. The same goes for Roméo and Juliet – more conventional in tempi than the "Italian." The five Brahms waltzes (you know, the ones you played with your piano teacher when you were young) make the disc worthwhile, thanks to Monteux's smooth and smoochy interpretations. Brahms would have blanched over Alfred Hertz's orchestrations, however. Now here's an eclectic mix of music. Pops standards rub elbows with the furrowed-brow masterworks of Brahms and Messiaen. The latter's L'Ascension gets an unusual performance here: as quick and hot as lightning, and visionary. (With Stokowski's, this must have been one the first performances of this score in the United States.) The Tragic Overture is taut, and all of the many moods in the solitary movement from Brahms' First Symphony are given their chance to come to a full blossoming. The Mignon overture sparkles, while The Sorcerer's Apprentice is made to seem more threatening and grotesque and less brilliant than it can be. Rossini's overture sounds a little rough around the edges, particularly because of a haphazard oboe solo. Monteux adds welcome toughness (and a weird string vibrato!) to the Valse triste, elevating it above the usual salon fripperies. The Euryanthe overture races along excitingly, and Monteux shows his affection for the United States (or least for Sousa!) in a rousing and yet almost balletic performance of The Stars and Stripes Forever. Again, like Cluytens, Monteux gloried in Russian music, and it played a big role in his concert programs and in his recording schedule – and not just in San Francisco. The savage fun of Borodin's Polovtsian Dances is marred only by a few seemingly pointless cuts. (There is no chorus, either.) The third movement of Rachmaninoff's Second also has cuts, which were more usual at the time. Nevertheless, it's a distinguished performance, filled with emotion but not with syrup. The second movement, played after the third, is uncommonly intense. If only Monteux had left us the whole symphony, in one medium or another. Rimsky's Capriccio espagñol is a party that threatens to get slightly out of hand. Even concertmaster Naoum Blinder sounds a little tipsy in his solos. Similarly, the Russian Easter Overture, well-played as it is, seems to look back to a time when the imaginations of Russians living far from cities dwelt as much on devils and witches as they did on saints. In contrast, the Christmas Eve suite sparkles with the innocence of new snow, Monteux turns Glazunov's Scènes de ballet into a mountain of whipped cream – not inferior to his ballet The Seasons, in a performance such as this one! This all-Franck disc begins provocatively with Gabriel Pierné's sometimes not very Franckian orchestration of the Prelude, Chorale, and Fugue – certainly one of the masterworks of the piano literature. In its own way, it is no less splashy than a Stokowski arrangement of Bach, and Monteux's performance has that same Stokowski-like quality of important yet delicious shamelessness. Monteux also brightens up the sepia tones of the excerpts from the now neglected Rédemption and Psyché. The Franck Symphony was one of the conductor's signature works. He made commercial recordings of it three times – twice in San Francisco (on either side of this 1946 performance), and most famously, in Chicago. The Chicagoans' playing trumps that of the San Franciscans, and the RCA Victor "Shaded Dog" recording still sounds remarkable, even on CD. Still, there is nothing like a live performance to add a shiver of excitement, and only the occasionally rather rough and scratchy condition of this broadcast gets in the way of pleasure – and then, not very much at all. Apparently this is the only work longer than 23 minutes that the conductor was allowed to program for these Sunday evening broadcasts. Apparently the sponsors realized that chopping up Monteux's Franck would be like hacking the arms off of Michelangelo's David. More pops heaven. Lord knows Grétry's music doesn't need to be played by a full-size symphony orchestra (and perhaps it shouldn't be), and yet what Monteux does with it makes it all worthwhile: Grétry has never sounded so much like Offenbach! Monteux also makes the Nicolai overture into a racy romp, thus belying its German origins. Massenet's virtually forgotten Phèdre overture turns out to be a pretty good piece of music, with lots of heavy-breathing in this composer's best style, and Monteux squeezes as much juice as he can from it. Without shortchanging the Spanish rhythms in The Three-Cornered Hat Suite, Monteux emphasizes the music's alluring melodies. Neither William Tell nor Tannhäuser are business as usual; Monteux's light touch in both keeps the music from sounding hackneyed. A similarly light touch in Respighi's Fountains of Rome also wards off bombast, without compromising the score's picture-postcard attractions. The Beethoven is gripping, thanks to sharp dynamic contrasts and very purposeful tempos. Still, there is both light and shade to this reading, and a Classical poise. (I disagree with the annotator's assertion that Solomon is "serene" and "witty" here, although the temperamental differences between the pianist and the conductor make this performance particularly interesting and compelling.) Somehow, when Liszt orchestrated Schubert's Wanderer Fantasy, the music's intelligence seemed to drop a few notches. In this version, it is more a flashy showpiece than something to be taken seriously. Still, Lili Kraus's pianism does its best to keep the music on the up-and-up, and Monteux supports her ably. I was a little disappointed in the Tchaikovsky, mostly because Cherkassky's playing seems fast and perfunctory, and also the sound is scratchy, and not as immediate as almost everything else in this collection. No such reservations apply to the craggy and very individualistic Brahms, in which the Orchestra's concertmaster again comes to the fore, joined by his brother, the principal cellist. This last disc is the equivalent of an "everything" bagel. Monteux was no stranger to English music. For example, hear his fine recording of Elgar's Enigma Variations. His performance of Walton's silly Façade music (admittedly, much sillier without the recitations) has less stout and Stilton than a more continental wit. The Schumann Fourth receives a revelatory performance. I don't think I've ever heard it played with more brio and muscle. The same qualities apply to the Mozart as well, which strays just about as far from powdered-wig territory as it can. (The annotator's comment about a "more buffo than Olympian" first movement is right on the mark.) A third movement shorn of repeats assists this reading in coming in under the 23-minute mark. I don't know why the aria from Alfano's verismo opera Risurrezione was sung in French, but I have translated the title back into Italian. (Alfano, of course, is most famous for completing Puccini's Turandot, and this aria, at least, is worthy of the master.) Warenskjold has a large, lovely voice, and her passionate singing on this aria makes me want to hear more from her. Pohjola's Daughter pulses with atmosphere and with sensitive orchestral playing; you'll seldom hear Sibelius's music sound more beautiful than this. Over 14 hours of enjoyable listening come to an end with Chadwick's peppy Jubilee, a fine reminder that Monteux became a citizen of the United States in 1942. Even though the conductor always remained a Frenchman, he threw himself into being an American the way that he threw himself into his conducting, and this performance knits those two activities together.